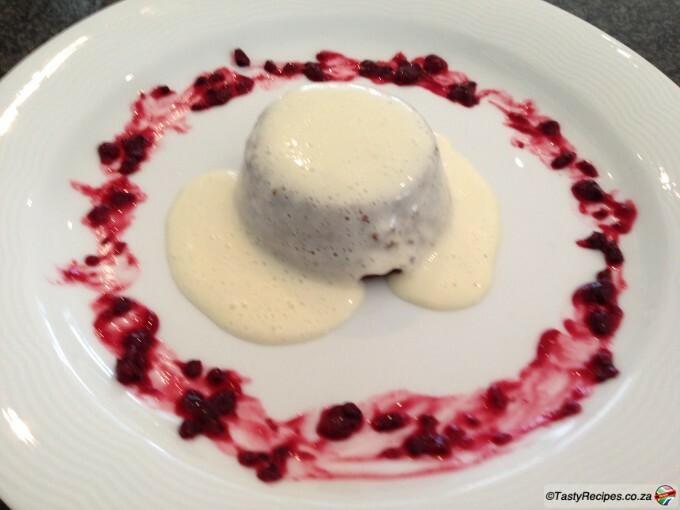 Malva Pudding is a traditional South African dessert generally served with custard. It is made with apricot jam and has a spongy caramelized texture. It is often found on the dessert menu of South African restaurants. These have been baked in a muffin pan and served with a creme anglaise and a berry coulis. Beat together sugar,egg,butter and jam until fluffy. Combine milk, vinegar and vanilla. Sift flour and bicarb and add to mixture alternately with milk. Pour into muffin pans and bake for approx 20 mins.until firm. Remove from oven and pour over sauce. To make sauce, place all ingredients in a pot and bring to boil. Serve with creme anglaise and a berry coulis.